I’ve heard the wildest theories about the significance of this van among the foreign residents of Toyota City. One couple even thought that the van belonged to a cult in search of new members. But nothing could be further from the truth. 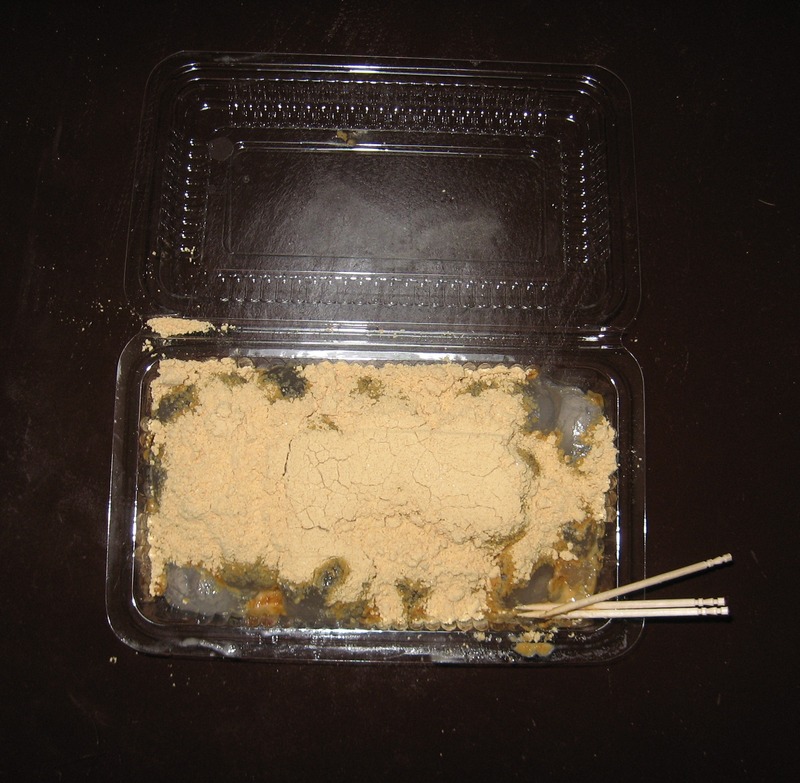 The van is selling ‘warabi mochi’, a jelly like candy dusted with sweet soybean powder, popular in the summertime. Warabi mochi: jelly like white balls with soy bean powder. Doesn't look very appetizing, does it? But the taste is refreshing in summer. In the wintertime there is a similar van that sells grilled sweet potato (yaki imo). And of course this van also has its own song. Grilled sweet potato (yaki imo) - again doesn't look that appetizing, does it? The taste is described by its name: it tastes slightly burned and like a potato, only sweeter. This entry was posted in Food, Japan and tagged Food and drinks, Impressions of daily life, In the streets, Songs, Summer, Toyota City, Winter by Haruko-chan. Bookmark the permalink. 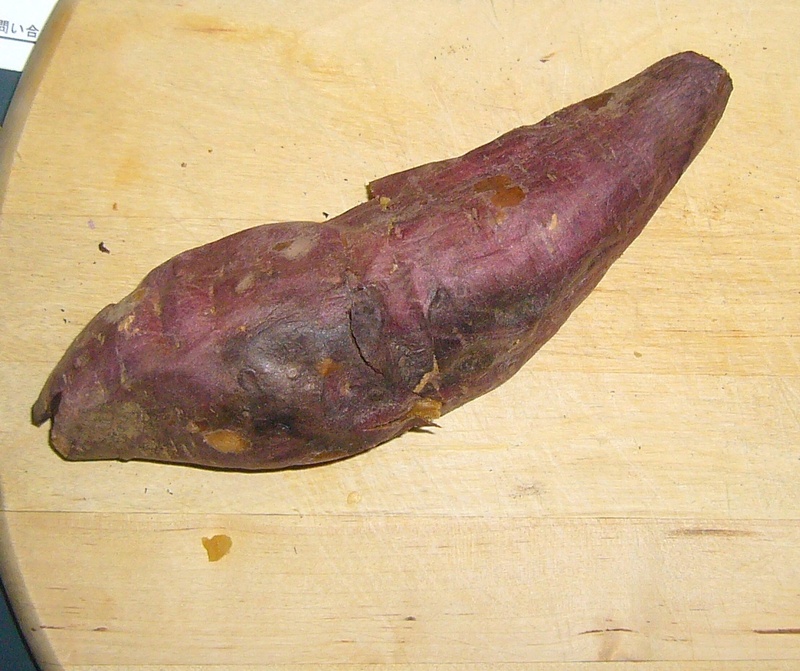 I think yaki imo is like a cross between a sweet potato and a white potato. They are much drier and less sweet than the sweet potatoes available in the U.S., which made for some interesting cooking failures in trying to make them behave like the sweet potatoes back home. I finally figured out that yaki imo is like most things in this world, they shine when they are allowed to be who and what they are. 😉 I hope you were able to try some of the yummy things made from yaki imo this past fall, like cookies and a baked custard-type dessert. Totemo oishikatta to omou. I can relate to your story. I had the same thing happen to me when I tried making Belgian apple pie with Japanese apples. They don’t want to be anything other than Japanese apples and thus my pie didn’t work out too well. I didn’t try the cookies or custard-type dessert yet. Maybe I can still find some sweet potatoe and try to make it. Do you have any recipes?